Help students overcome math anxiety. 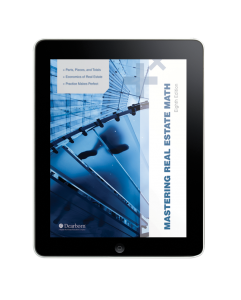 This comprehensive workbook improves math skills and prepares students for actual real estate practice. Multiple in-chapter and additional practice problems, along with real world exercises, provide plenty of practice in each area. Step-by-step instructions simplify even the most complex calculations. Instructor Resources include learning objectives, instructional strategies, exam bank, answer keys, and a PowerPoint presentation to help prepare for class.